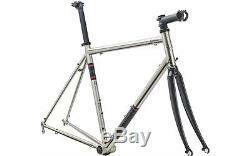 Genesis Equilibrium Stainless Frameset Great for training frame will take full guards 25/28 tyres Needs 57 drop brakes. This is a brand new frame that has been stripped down from a bike so has build marks. Including: Frame, fork, headset & seat clamp (not seat pin). Frame : KVA MS3 Double-Butted Stainless Steel. Fork : Carbon Road w/ Alloy Steerer. Headset : FSA Orbit Equipe Sealed Cartridge incl. Weight: Frame - 1.94kg / Fork - 0.59kg (56cm). Front Derailleur: 28.6mm Band-on not incl. Bottom Bracket: 68mm British not incl. Seatpost: 27.2mm not incl. Seat Clamp: 29.8mm incl. This item can be viewed at our shop and all come with a full manufacturers guarantee - Unit 4H Hillam Court, Hillam Road, BD2 1QN. To pay by credit/debit card call Paul Milnes Cycles on 01274 308860. 1 - Horizontal Toptube Length (mm). 2 - Seat Angle (°). 3 - Headtube Length (mm). 4 - Head Angle (°). 5 - Seat Tube Length (C-T, mm). 6 - BB Drop (mm). 7 - Chanstay Length (mm). 8 - Fork Offset (mm). 10 - Wheelbase Length (mm). The item "Genesis Equilibrium Stainless Frameset Stainless Steel Frame & Carbon Fork" is in sale since Saturday, May 21, 2016. This item is in the category "Sporting Goods\Cycling\Bike Frames". The seller is "paulmilnescycles1978" and is located in Bradford.